1. It is generally believed that Our Blessed Lady died, since she would not have wished to escape death any more than her divine Son did. Our Lord, however, had seen her sharing in His agony and death upon Mount Calvary, and He willed that her own death would be so peaceful as hardly to justify the name. The just die in the love of God and the martyrs died for the love of God. But Mary died consumed by the love of God. It was not disease which brought an end to her life, but love. Her love for Jesus was more ardent and more perfect than that of any other creature. She loved Him when she held Him in lier arms in the stable at Bethlehem, when she fled with Him into Egypt, and when she offered Him in the temple to His heavenly Father. She loved Him when she found Him after He had been lost and when she looked after Him in their home at Nazareth. She loved Him as she followed Him to His death on Calvary. She loved him in the joy of His Resurrection and, subsequently, of His Ascension into Heaven. Jesus desired her to remain o ii earth for a while to comfort the infant Church and to initiate the loving patronage which she would exercise over it in Heaven. Her love grew from day to day until it entirely consumed her and her immaculate heart could no longer contain it. Mary fulfilled in a most perfect manner the Creator's command to His creatures to love Him with all their hearts and with all their strength. Consequently, her love reached such a peak that her soul in its final ecstasy glided from her body. Let us ask our Mother, Mary, to help us to die with the love and grace of God in our hearts, and with the names of Jesus and Mary on our lips. 2. Even as Christ by His own power rose from the grave, so by reason of His intervention the soul of Mary was reunited, after a short separation, with her body, and she was taken up body and soul into everlasting glory. It was fitting that this privilege should have been bestowed on the Mother of God. It would have been unbecoming for the immaculate flesh in which the divine body of Jesus was formed to have been allowed to corrupt in the grave. It was fitting, too, that she who was to be proclaimed Queen of Angels and of men should have come immediately to her throne of glory with her humanity integral and unimpaired. Her resurrection was, moreover, the reward of her virginal purity. From the first moment of her conception she was preserved free from original sin and from every evil inclination, and throughout her life she had advanced farther and farther in the way of perfection. We shall rise one day also, O Blessed Mother. Grant in your Krcat love for us that we may so imitate your example as to deserve to rise in glory and to be associated with you in everlasting happiness. 3. 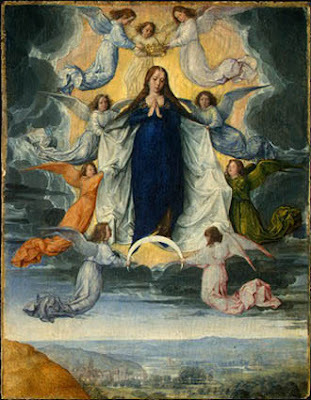 After she had risen, Mary was gloriously taken up into Heaven. Jesus has ascended into Heaven by His own power, but Mary was borne aloft by the Angels, whose Queen she was soon to be proclaimed. She reigns in Heaven with her divine Son and looks down in love and mercy on her exiled children, whom she is ever ready to assist. She was the humblest and most exalted of creatures (Dante, Par. XXXIII, 2) for when told that she was to be the Mother of God, she desired to be called His handmaid. Humility is the Mother of all the virtues even as pride is the source of all the vices. If we wish to share in Mary's triumph, we must first of all share in her humility. Everyone who exalts himself shall be humbled, Jesus has said, and he who humbles himself shall be exalted (Luke 14:11). God resists the proud, we are reminded by the Apostle James, but gives grace to the humble (James 4:6). The glorious Assumption of Mary contains a lesson in humility for all of us.